MB happened upon a new Vietnamese restaurant today in Cairns' city. 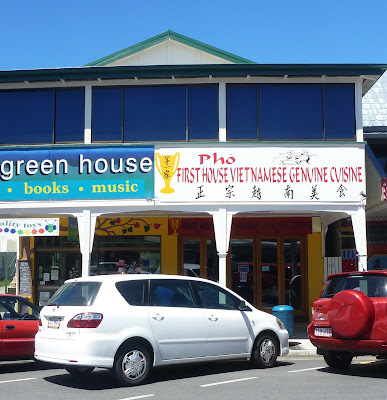 She was visiting the excellent Green House next door for a spot of gift shopping and it transpires that Pho First House Vietnamese Genuine Cuisine (PFHVGC) has been open for about a week and a half. MB asked Green House lady if she'd been, but alas she's a vegan so unable. Cairns has been crying out for decent Vietnamese food for years so hopefully this new spot will fill that need. There is a Chinese/Vietnamese restaurant in Aplin St that MDR & MB visited once, the so-called Vietnamese dishes were dreadful so haven't been back. MB did drop in to the PFHVGC and picked up a menu, not off to a great start with such a mouthful of name and the menu is pretty basic. However if they can deliver on super fresh, genuine Vietnamese cuisine MB will forgive them anything. Can't believe you didn't have a quick bowl of Pho. You've left us hanging. Yeah, I was dying to sample some Pho & cold rice paper rolls but I'd just eaten lunch not 10mins beforehand. Never fear a review is imminent.